Ahead of their November 5th nuptials, Jeremy Vuolo told his bride-to-be, Jinger Duggar, that he likes wedding dresses with long trains. The pro soccer player certainly got his wish...and much more. Jinger walked down the aisle in a custom wedding gown with a 13-foot train, 5,000 pearls, and antique lace. The dress was designed by Renee Miller of Renee's Bridal and Special Occasions of Pensacola, Florida. Girlz 4 Christ Magazine will be running an article about Renee's experience working with the Duggars in its winter issue, slated for release on December 21st, which also happens to be Jinger Vuolo's birthday and the first day of winter. The editor of the publication gave us permission to share the first page of the article. Visit the Girlz 4 Christ Magazine website to sign up for a free digital subscription. Double click the article to show a larger version. For a list of Jinger's bridesmaids, check out our December 3rd post. For more wedding photos, take a look at our November 23rd post. Come back to the blog tomorrow for more more photos and an exclusive opportunity that we know you'll love! 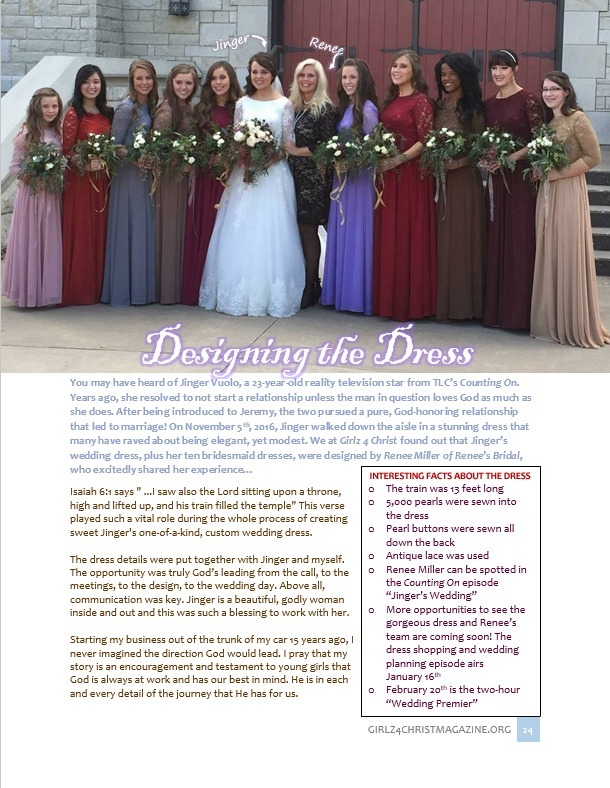 Jinger's wedding gown is, by far, my favorite of the Duggar girls wedding gowns. It's the length of the train that does it every single time for me. Why can't she have gotten a local shop's dress? Who travel to Virginia and then Florida to get a wedding dress when you're "of humble means, and live modestly" like the Duggar family claims? How much did this dress and veil cost and who paid for it? She is a reality television starlet and the wedding gown was wardrobe for the show. Perhaps they are friends? Perhaps Renee wanted to make her dress? Maybe Jinger saved up her earnings from 19 Kids and Counting On to pay for her dress. It really doesn't matter whether she went out of the state or next door for her dress. It was a beautiful dress and she looked lovely in it. Picky,picky,picky..............Why should this be so important to you? Why does it matter to you? As long as it didn't come out of your bank account, who cares? Jinger was gorgeous, the train was gorgeous, the dress was beautiful, and I agree with 7:06 pm; the Duggars have certainly come a long way. Wonder if they still make their own laundry detergent? Personally, I don't care what the Duggars wear. However, I can see why someone would question the elaborate and likely very pricey efforts to procure a wedding gown, since the family has made a big deal about their frugal ways and shopping at thrift stores. It's been their theme for a good many years, "Buy used and save the difference." You don't really have a right to judge people for what they spend their money on. You want someone breathing up your neck when you order a pizza? Lol just saying, someone living light doesn't mean they can never treat themself. They have lived frugally for many years, perhaps so they could save up for special occasions like this (and, of course, so that they can share with others. 1:23 PM, 2:04 PM, and 2:57 PM -- Why do some people here think they have the right to reprimand other comments for their honest questions? If you disagree with someone's comment, so be it. Enough with this wedding already. Are they back from their honeymoon? When are Derick and Jill heading back to CA? When were they in California? Some of us like hearing about the wedding. Also, no one is forcing you to read this. Her dress was beautiful and so were the bridesmaid dresses. I love the article about Renee's experience. I especially appreciate Renee's encouragement to young girls and women. Thank you Ellie and Lily! Thanks Regina! We hope the other articles in this magazine can be an encouragement as well! You are welcome Girls 4 Christ Magazine! I'm sure they will be. Thank you for taking the time to do the article on Jinger's wedding. I'm past the age the magazine targets but I will send the link to my daughters. I live in Pensacola. So glad to know we have a great designer. It looks beautiful! Small world! Her husband was one of my teachers in college. She did a beautiful job with that wedding dress! I'd like to know that writer's definition of "antique" lace, how much was used, where it came from, and where it was used on the dress. To be an antique, something must be at least 100 years old. I buy old laces and trims for sewing and dressmaking. If I do find older lace, it's most likely "vintage" (1930's to 70's). It's not always easy to find lace that age that's still dead (bridal) white. Even my best New York City source for bridal lace only sells "vintage" lace with a disclaimer that it will not be perfect or uniform color due to age. I've bought true "antique" lace from other sources, but it's usually yellowed or browned with age. Any lace stored touching regular paper or cardboard (or wood) will turn brown due to acids leaching from the paper. You can use a restoration cleaner on old lace, but you can't always bring it back to its original (bridal) white. So when I read that "antique" lace was used on Jinger's white wedding gown, I wondered. Unless other proof is given, it's possible that term is being used liberally. Or there might have been "touches" of antique lace somewhere on the gown. Cost for such items can be prohibitive ($50 to $300 a yard retail is not uncommon), and yardage availability limited, since it's no longer produced and you have to find a source that has enough stock-on-hand for your project. I insist on some sort of provenance before I buy, if someone is claiming that lace is truly "antique." What is the purpose and intent behind this comment? I think most people don't know that something isn't "antique" unless it's 100 years old. You are incredibly knowledgeable! I just learned a whole lot. My brother (who unfortunately passed away) made my dress with a 14' train and the antique lace was tea colored. Still beautiful. I enjoyed your post. oh brother. who cares, maybe it looked antique..sheesh. Can't you just graciously enjoy the beauty of the dress and refrain from picking it and facts about it apart? Be nice! I agree with the question of the term antique. If a business is selling something they claim to be antique, then by all means it should be questioned and they should have the necessary information to back up their claim. But in this case, we don't know if the writer of that article used the term, or if the dress designer provided that information. If so, then what is the story behind this antique lace? And where can other brides find something like that for their white gowns? Seriously who cares about the age and if it meets your standards of vintage or not! Thanks, 3:02. My grandparents had an imported fabric business in New York for decades. I grew up playing with boxes of fabric and trim and buttons. I have an appreciation for older textiles and sewing notions, so whenever I hear "antique," my ears perk up. I've seen what happens to a lot of old lace, especially when it hasn't been properly stored or preserved. I'm not saying it's impossible to find antique lace and put it on a modern-day gown, I'm just asking for some verification of that term in this case. What was the source? Was it found still on the roll, or was it removed from a 100+ year old gown and reused? Or was it from something only 50 years old? Did it have to be restored first? Questions. Kathy Borders and 4:28 PM, why don't YOU be nice? Everyone has a right to comment, and he/she was just asking questions. Antique is something 50 years or older, not 100 years. That was the "official" courting time from rooftop to ring. But they knew each other longer than that. He's in family pictures from last year at this time. Don't expect to ever get a full explanation or real concept of "Duggar time." It's warped for TV purposes. I think it's sweet that they think there's something wonderful about their boyfriends/husbands. That's actually a pretty common way to feel about someone when you're in love with them. The work put into making the dress; No wonder it is that beautiful. I don't believe Jinger owes any explanation where she bought her dress, how much it cost, OR Who paid for it. What a classless comment ! This is a post about the dress and the designer who made it. Of course those questions are going to come up. If this designer wants the advertising that comes with having a dress featured on a TV show, then she should be ready to answer those questions, too. Anyone who promotes their business should be prepared to speak about his/her prices. The Duggar family has built much of their image on their motto "buy used, save the difference". If they were a typical family who made it big, I don't think people would object as much, but now it seems rather hypocritical that they really only followed that motto until they became wealthy. Most of their viewers are probably people of average means, and maybe have even taken their financial advice. It just rubs me the wrong way to see their extravagance now. I find it unfortunate that people begrudge Jinger the dress of her dreams. It's not like the rest of the wedding looked especially expensive (nice, but not expensive). An know 2:57. Maybe Jinger and Jeremy pitched in their own money for the dress, Jinger has her own royalties from the girls book and from the show,maybe just maybe buy used and save the difference is not so implemented for the dress as they save on other parts, for instance, a full course meal for all those guests would definately cost more than her dress, so yes they can splurge.Now Jinger will have her own set of rules for her household, so don't freak out folks when they do things a little different then her parents do. Jinger's dress was stunning as any custom made dress should be. I have to somewhat agree with the poster who is rightfully questioning why the Duggars continue such a false facade of thrift shopping. I don't begrudge them their wealth or ability to live very frivolous lifestyles. They have been outstanding at marketing themselves so kudos to them. But...as professing Christians the obvious lying about how they truly live is just that...lying. Anyway, beautiful bride with a beautiful life ahead I'm sure. I don't see them as lying about anything. Way back when the show started they DID do everything they said they did. I haven't seen any current promotions about homemade soap and they like. They DO continue to thrift shop but that doesn't mean you have to buy EVERYTHING at a thrift shop. Having a new dress made for her doesn't mean anyone is lying. Maybe all her thrift shopping was to save for something like this. Thanks for sharing this, and welcome to our new readers! We'd love to hear everyone's feedback on the issue this article will appear in. Less than a week to the release date! Is there a parallel Boyz 4 Christ magazine? Why divide the sexes and make something only for Girlz? In this day and age, equality should be promoted, not stereotypical gender roles. We would be happy to help get a Guyz 4 Christ started if someone came along to head it up, but we do not have the resources to manage it at this time. There are plenty of coed Christian teen mags out there. However, we saw a real need for a Christian magazine that catered specifically to girls' needs. It's certainly not a stereotypical thing; most secular teen mags are specifically for girls as well! I doubt Christ cares to earn favor from one specific gender, so how about making a magazine that's called Kidz 4 Christ? Why separate the girlz from the boyz? There have been both magazines targeting ladies and just men for centuries both secular and religious. I see no problem with it. Well, if Jinger was sold an "antique lace" dress that did not actually contain "antique lace," then it could be considered fraud by the dressmaker. You can't put someone in polyester and call it silk. You can't say antique anything unless you mean it. Where did this lace come from? How did Jinger end up with it? What did it cost? dress Anna humbly made herself. differently and appears humble most of the time. Yes, and Anna looked every bit as beautiful in her handmade dress. I agree, Anna was a gorgeous bride, and her bridesmaid's frocks were also really elegant. Even with 300 guests her family and Church were able to provide a delicious feast at the reception. That was a lovely episode in 19K&C. Jingers dress was beautiful! I have a friend who got married a few years ago and her dress had lots of lace like Jingers. The difference is that my friend had straps and she chose to not have a train. Jinger looked gorgeous and her wedding dress was absolutely stunning! Her designer did an excellent job and is top-notch. Anyone would be blessed and look fabulous in Renee's designs! Jinger looked lovely and the dress is a work of art. But, like many young couples, way too much money was spent on a wedding and honeymoon when the couple has nothing. Why not a modest wedding and honeymoon? I guess when your job is to be on TV, you can take off as much time as they did and enjoy these life luxuries. It's gonna be a shock for Jinger to go 'home' to that one bedroom apartment in Texas. I don't think my back could survive hand sewing so many pearls! I'm sure Renee had many sewing bees to get all those pearls sewn on. I love sewing and I would have loved to help with Jinger's dress. How do they justify the extravagance and expense for something that was only worn once? Maybe if it was a different family it wouldn't bother me as much but the Duggars LOVE to emphasize how thrifty and practical they are, even now that they are wealthy. The wedding was beautiful, it just seems like they could have put that money towards building their new life together. Not only worn once, worn for just a matter of hours. Sometimes brides get so wrapped up in the fantasy of a wedding that they lose all perspective. The Duggers probably do like the Bates and give their daughters a certain amount to spend per wedding. Then anything over that the bride pays herself. Jinger may have been saving for a special gown for years. We don't know, and it isn't our business. The gown was stunning, and I am happy for her no matter how she paid for it. I would really like to know how much of the wedding and the honeymoon the Duggars actually paid for and how much was paid for by TLC. If she gets going, she could have 19 daughters to hand it down to someday. Jessa's having all boys (Ben already decided that), so it's up to Jinger to balance things out. Has anyone ever stopped to think maybe Jeremy paid for the dress, or half on it? Let's face it folks, the Duggars have changed. At any rate no matter how she got the dress it was gorgeous and Jinger made a beautiful bride.